Controls, Hand Controller, 30-ATC, CAT-50 Taper Spindle, 26” x 55” Table, Chip Conveyor, Coolant. CAT-40 Taper Spindle, 60-6000 RPM, Renishaw Probe System, Bryant Hi-Speed Power Spindle System, 40” x 40” x 20” Travels, 19 ½” x 47” Table, 21” x 40” Vacuum Plate, Coolant. Matsuura MC-1000 VS2 CNC Vertical Machining Center s/n 84033693 w/ Yasnac MX5 Controls, 30-Station ATC, CAT-40 Taper Spindle, 60-6000 RPM, Bryant Hi-Speed Power Spindle System, 40” x 40” x 20” Travels, 19 ½” x 47” Table, 21” x 40” Vacuum Plate, Coolant. Controls, Hand Controller, 21-Station ATC, 40-Taper Spindle, 20” x 44” Table, Coolant. 16” x 35 ½” Table. 40-Taper Spindle, 16 ½” x 33” Table, Coolant. Taper Spindle, 80-3800 RPM, Chrome Box Ways, 16 ½” x 51” Table, Coolant. Dahlih DL-3 3-Axis CNC Vertical Mill s/n 30240 w/ Anilam Crusader-M Controls, Universal Kwik-Switch Taper Spindle, 80-3800 RPM, Chrome Box Ways, 16 ½” x 51” Table, Coolant. Taper Spindle, 60-4200 Controlled RPM, Chrome Ways 9” x 42” Table. Hurco KM3 3-Axis CNC Vertical Mill s/n SDD-9005111A w/ Hurco Ultimax Controls, Universal Kwik-Switch Taper Spindle, 60-4000 RPM, Chrome Ways, 11 ¾” x 42” Table. Chevalier / Proto-Trak FM-32HP 2-Axis CNC Vertical Mill s/n HP847022 w/ Proto-Trak M2 Controls, 60-4500 RPM, R8 Spindle, Chrome Box Ways, 10” x 50” Table. Chevalier / Proto-Trak FM-32HP 2-Axis CNC Vertical Mill s/n HP-848026 w/ Proto-Trak M2 Controls, 60-4500 RPM, R8 Spindle, Chrome Box Ways, 10” x 50” Table. Chevalier / Proto-Trak FM-325 SP 2-Axis CNC Vertical Mill s/n BP-848023 w/ Proto-Trak M2 Controls, Speed-Rite Digital Spindle Drive Controls, R8 Spindle, 9” x 42” Table. Bridgeport / EZ-Trak 2-Axis CNC Vertical Mill s/n 257401 w/ EZ-Trak Controls, 2Hp Motor, 60-4200 RPM, Universal Kwik-Switch Taper Spindle, 9” x 48” Table. Supermax CNC-20-OEM 2-Axis CNC Vertical Mill s/n 8041009 w/ Anilam 3200MK Controls, Trachier “Toolmaker” Digital Spindle Drive Controller, R8 Spindle, Box Ways, 9” x 49” Table.Tri-Onics 2-Axis CNC Vertical Mill w/ Tri-Onics Handyman Controls, 60-4200 Dial RPM, Universal Kwik-Switch Taper Spindle, Chrome Ways, 10” x 50” Table. Chevalier FM-3VKH CNC Vertical Mill (NO CONTROLS) s/n HM-8371114 w/ 60-4500 Dial RPM, Chrome Box Ways, 10” x 50” Table. 2000 Haas SL-30 CNC Turning Center s/n 63069 (CONVERTED TO CNC GRINDING CENTER) w/ High Speed Grinding Head with 12” Spindle Shaft, Tool Presetter, 3400 Spindle RPM, Rigid Tapping, Quick Code, Delta WYE, Macros, Spindle Orientation, 1mb Extended Memory, BIH Bar Feed Interface, Floppy Disc, 10” 3-Jaw Power Chuck. (2)Chevalier FCL-1840A CNC Lathe / Grinder w/ Anilam 4200T-Plus Controls, 40-2000 RPM, 8” 3-JawChuck. Chevalier FCL-1840A CNC Lathe / Grinder w/ Anilam 1200T Controls, 40-2000 RPM, 10” 3-Jaw Chuck. Lion 25-MS 25” x 82” Geared Head Gap Bed Lathe s/n 1579 w/ Newall DRO, 10-1500 RPM, Inch/mm Threading, Taper Attachment, Tailstock, (2)Steady Rests, 15” 3-Jaw Chuck. 2001 Namseon Mecca Turn 600X1500 23 ½” x 59” Geared Head Gap Bed Lathe s/n 23150610 w/ 17-1200 RPM, Inch/mm Threading, Tailstock, 12” 3-Jaw Chuck. 1992 Supermax LG-2636 26” x 36” Geared Head Gap Bed Lathe s/n 80051 w/ 35-2000 RPM, Inch/mm Threading, Tailstock, 10” 3-Jaw Chuck. Supermax mdl. LG-2236 Geared Head Gap Bed Lathe / Grinder w/ Sony DRO, Tool Post ID Grinding Attachment, Inch/mm Threading, Tailstock, 12” 3-Jaw Chuck. Monarch mdl. 16CW 18.5” x 30” Geared Head Lathe s/n 11476 w/ 12-487 RPM, Inch Threading, Tailstock, 10” 3-Jaw Chuck. All American “Pacemaker” 16” x 30” Geared Head Lathe s/n 71475-49 w/ 25-1500 RPM, Inch Threading, Tailstock, 10” 3-Jaw Chuck, 15” 4-Jaw Chuck. Hardinge DSM-59 Narrow Bed Lathe s/n V59-1371-1 w/ 5C Collet Closer. Summit mdl. SC14 48” Vertical Turret Lathe s/n 516 w/ Sony DRO’s, 5-Station Turret, Facing / Turning Head, 48” 4-Jaw Chuck. 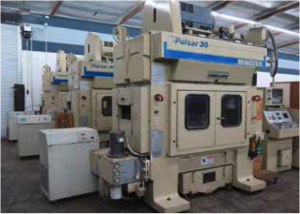 FMUA 44” Vertical Turret Lathe w/ 5-Station Turret, Facing / Turning Head, 44” 4-Jaw Chuck. Cooling Unit, Coolant Filtration Unit. 5C 4th Axis Head, Coolant and Filtration Systems.Pacific Controls mdl. 760-10 Die-Sinker EDM Machine s/n 7056 w/ Pacific Controls 25 Generator, System 3R Motorized Rotary Head, Sony DRO, 8” x 17” Table. Blanchard No.18 Rotary Surface Grinder s/n 8032 w/ 36” Dia. MagneticChuck, 20” Grinding Head, Coolant. Blanchard No.18 Rotary Surface Grinder s/n 7235 w/ 36” Dia. Magnetic Chuck, 20” Grinding Head, Coolant. Arter mdl. D16 16” Rotary Surface Grinder s/n 3396 w/ 17” Dia. Magnetic Chuck, Coolant.Blanchard No.11 Rotary Surface Grinder s/n 6726 w/ 16” Dia. Magnetic Chuck, 11” Dia. Grinding Head, Coolant. Vertical Rotary Grinder w/ Auto Cycles, Speed Controllers, 9” 3-Jaw Rotating Chuck, 14” Diamond Grinding Wheel. Cincinnati No.2 Centerless Grinder s/n 2M2H1L-145 w/ Hydraulic Wheel Dresser. ELB Type SWD15VA II 28” x 59” Automatic Hydraulic Surface Grinder s/n 96990171 w/ ELB Controls, 28” x 59” Electromagnetic Chuck, Coolant Filtration System. Chevalier FSG-1632AD 16” x 32” Automatic Hydraulic Surface Grinder s/n G3875006 w/ Chevalier Controls, Sony DRO, 16” x 32” Electromagnetic Chuck, Coolant. Kikinda URB-1000-A 12” x 39” Automatic Surface Grinder s/n 7635 w/ Automatic Cycles, Wheel Dresser, Electromagnetic Chuck. Chevalier FSG-1020AD 10” x 20” Automatic Hydraulic Surface Grinder s/n E1844003 w/ Chevalier Controls, Sony DRO, 10” x 20” Fine-Line Electromagnetic Chuck, Coolant and Filtration. Chevalier FSG-818AD 8” x 18” Automatic Hydraulic Surface Grinder s/n 03A-0053M w/ Chevalier Controls, Automatic Wheel Dresser, Walker Magnetic Chuck, Coolant. Thompson 8” x 24” Automatic Surface Grinder s/n 2F562084 w/ Walker Electromagnetic Chuck, Wheel Dresser, Coolant. Kent mdl. KGS-618H 6” x 18” Automatic Hydraulic Surface Grinder s/n 811001-1 w/ Electromagnetic Chuck. Harig Super-612 6” x 12” Automatic Hydraulic Surface Grinder w/ Magnetic Chuck, Coolant. Chevalier FSG-1632TX 16” x 32” Surface Grinder s/n G6834001 w/ Chevalier Controls, 16” x 32” Electromagnetic Chuck, Coolant. YAM mdl. GU-27-60H 10” x 20” Cylindrical Grinder s/n 270289 w/ Mitutoyo DRO, Drop-Down ID Grinding Head, 6 ½” 3-Jaw Chuck, Tailstock, Coolant. Brown & Sharp mdl. 1440U Cylindrical Grinder w/ Motorized Work Head, 10” 3-Jaw Chuck, Drop-Down ID Grinding Head, Coolant. Robin mdl. RUR500 Cylindrical Grinder w/ Power Work Head, 6” 3-Jaw Chuck. Vollmer Pornhan “Unilapp 600” Precision Tool Grinder s/n 757. Lars Tool and Cuter Grinder s/n 375-4. Oliver Large Diameter Drill Sharpener. P/A Industries mdl. CEJ-120 Automated Welding Machine s/n XP-315/C2347 w/ Harwi PLC Controls, Welding Head, Shear. Sciaky type SPK.1-15-75-18 75kVA Seam Welder s/n 9354 w/ iii Controls, 40” Throat. Janda type S218 Style CIRC Seam Welder s/n 12.2545 w/ iii Controls, 24” Throat. Lecco type ZP26 25kVA Spot Welder s/n HG303001 w/ 21” Throat. Teledyne Peer Spot Welder w/ 28” Throat. Chemitron AC/DC 300HF Arc Welding Power Source w/ Cart. Miller Dialarc HC CC-AC/DC Arc Welding Power Source s/n JC637543. Lucas Precision mdl. 441B-72 Horizontal Boring Mill w/ 15-1550 RPM, 50-Taper Spindle, Power Feeds, 48” x 74” Table. Bridgeport Series 1 – 2Hp Vertical Mill s/n 245932 w/ Acu-Rite III DRO, 60-4200 RPM, Universal Kwik-Switch Taper Spindle, Chrome Ways Power “X” and “Y” Feeds, 7” Riser, 9” x 48” Table. Bridgeport Series 1 – 2Hp Vertical Mill s/n 250309 w/ Acu-Rite III DRO, 60-4200 RPM, Universal Kwik-Switch Taper Spindle, Chrome Ways, Power “X” and “Y” Feeds, 9” x 42” Table. Bridgeport Vertical Mill s/n 264453 w/ Acu-Rite Master-MP Programmable DRO, 2Hp Motor, 60-4200 RPM, Universal Kwik-Switch Taper Spindle, Chrome Ways, Power “X” and “Y” Feeds, 9” x 42” Table. Bridgeport Vertical Mill s/n 253666 w/ Acu-Rite III DRO, 2Hp Motor, 60-4200 RPM, Universal Kwik-Switch Taper Spindle, Chrome Ways, Power “X” and “Y” Feeds, 9” x 42” Table. Bridgeport Vertical Mill s/n 253312 w/ Acu-Rite III DRO, 2Hp Motor, 60-4200 RPM, Universal Kwik-Switch Taper Spindle, Chrome Ways, Power “X” and Y” Feeds, 9” x 42” Table. Bridgeport Vertical Mill s/n 259449 w/ Acu-Rite Millmate DRO, 2Hp Motor, 60-4200 RPM, Chrome Ways, Power Feed, 4” Riser, 9” x 48” Table. Bridgeport Vertical Mill s/n 269747 w/ Acu-Rite Millmate DRO, 2Hp Motor, 60-4200 RPM, Chrome Ways, Power Feed, 9” x 48” Table. Bridgeport Vertical Mill s/n 267959 w/ Acu-Rite Millmate DRO, 2Hp Motor, 60-4200 RPM, Chrome Ways, Power Feed, 9” x 48” Table. Bridgeport Vertical Mill s/n 261033 w/ Acu-Rite Millmate DRO, 2Hp Motor, 60-4200 RPM, Chrome Ways, Power Feed, 9” x 48” Table. Bridgeport Series 1 – 2Hp Vertical Mill s/n 221162 w/ 60-4200 RPM, Chrome Ways, 9” x 42” Table. Bridgeport Wide Ram Vertical Mill s/n 72399 w38” Cross Ram Travel, Chrome Ways, 9” x 48” Table.Chevalier FM-3VS Vertical Mill s/n BM83C681 (NO SPEED CONTROLS) w/ Newall DRO, Power Feed, 9” x 42” Table. 1994 Supermax YCM-2AVS Vertical Power Mill s/n 4053773 w/ 85-3800 Dial RPM, 40-Taper Spindle, Box Ways, Power Feeds, 11” x 51” Table. Supermax YC-2VAS Vertical Power Mill s/n 10955 w/ Anilam DRO, 85-3800 Dial RPM, Universal Kwik-Switch Taper Spindle, Box Ways, Power Feeds, 11” x 51” Table. Supermax YC-2VAS Vertical Power Mill s/n 10956 w/ Anilam DRO, 85-3800 Dial RPM, Universal Kwik-Switch Taper Spindle, Box Ways, Power Feeds, 11” x 51” Table. Trump K2V Vertical Mill s/n K2V-2079 w/ Mitutoyo DRO, 3Hp Motor, 70-4200 RPM, Chrome Ways, Power Feed, 9” x 42” Table. Webb Vertical Mill s/n 801948 w/ 1Hp Motor, 80-2720 RPM, 9” x 42” Table. Ex-Cell-O Vertical Mill w/ Sargon DRO, 66-2500 RPM, 5 ½” Riser, 9” x 42” Table. IVAC mdl. X52K Vertical Mill s/n 750187 w/ 30-1500 RPM, 50-Taper Spindle, Power Feeds, Box Ways, 1250mm x 320mm Travels. Milwaukee mdl. 5H-Vertical Power Vertical Mill s/n 25-4070 w/ 13-1300 RPM, 50-Taper Spindle, Power Feeds, 18” x 94” Table. Jet mdl. JMD-18PF Milling/Drilling Machine s/n 5118363 w/ 150-2500 RPM, Power Quill. Columbia 10’ Hydro-Mechanical Power Gap Shear w/ Dial Back Gauging, 18” Throat at Gap.52” Power Shear. New Dimension mdl. P4-125 10GA x 48” Power Roll s/n 11871049 w/5” Rolls. Strippit mdl. Super 30/30 30-Ton Fabrication Press s/n 1416121075 w/48” x 102”Table. Comaca 8 5/8” x 8 5/8” Power Notcher w/ Power Fence System. Boschert type PN4 8” x 8” Power Notcher s/n 192 w/ Fence System. Whitney-Jensen mdl. 200 6” x 6” Power Corner Notcher s/n 50/69. Whitney mdl. 609-480 45-Ton 6” x 6” Angle Shear s/n 609-480-31235. Chicago 8’ Mechanical Press Brake w/ Dial Back Gauging, 7 5/8” Throat, Eagle Eye Light Curtain. Niagra No.A3 ½ 35-Ton OBI Stamping Press s/n 28936 w/ 17 ½” x 27” Bolster Area. Niagra No.A3 ½ 35-Ton OBI Stamping Press s/n 20921 w/ 17 ½” x 27” Bolster Area. L & J No.4 ½ OBI Stamping Press w/ 18” x 28” Bolster Area. Durant Press Room Equip mdl. MD-30 30” Roll Straightener s/n 1025. Clarke & Lewis mdl. HCB-125 Draw Type Power Bender s/n 1139 w/Tooling. Fipi / Prima mdl. F63M Sliding Ram Die Cut Press s/n 75S096944 w/ 19 ½” x 25” Ram Die Area. Hydraulic OBI Stamping Press w/ Enerpak Power Unit. Engel mdl. 835 Progressive Roll Former s/n 6-502. Lion mdl. 1836 18GA x 36” Cleat Former s/n 337. Lockformer 24” Pneumatic Button Punch Cheek Bender. Maytool mdl. MTC-52H 52” Power Circle Shear s/n 0482 w/ Speed Controller. Rotex mdl. 18A55 18-Station Turret Punch s/n 11413. Lockformer 16GA Cap Hydraulic Speed Notcher s/n VG2264 w/ (5) Notching Heads. Pexto mdl. 1A 4-Station Power Beader/Crimper. Niagra Power Roll Beader w/ 30” Throat. Edwards-Kennard mdl. 41 41” Roll Press s/n KEE11310793. Lockformer 18GA x 60” Roll Beader s/n 765 w/ (5) Beading Heads. Roper Whitney / Pexto mdl. 6317-C 18GA Power Roll Crimper s/n 209-6-82. Beverly mdl. 750 Edge Notcher s/n 1306-71. Gould & Eberhardt 16” Shaper Machine. Famco No.4 Arbor Press w/ Stand. Lawson Pacemaker II mdl. 42 42” Paper Shear s/n 1097 w/ Autoset Spacer Controls. Blanchard mdl. 22ED-42 CNC Rotary Surface Grinder s/n 14956 w/Mitsubishi CNC Controls, 42” Dia. Electromagnetic Chuck, 23” Grinding Head, Polycon Coolant Filtration System. Series 0i Mate-TC Controls, Hand Wheel, 11 ½” x 34 ½” Table, 12” 3-Jaw Chuck. Speedfam Double Sided Lapping Machine s/n 1100-1276 w/ 44”Lapping Plates, Pneumatic Down Force, Slurry Pump and Controls. R.H.Strasbaugh mdl. 6BA-4 Lapping Machine s/n 0530985 w/ 26” Plate, (4)Lapping Rings, Slurry, Timer. Lapmaster mdl. 24 24” Lapping Machine. Morey 8” Vertical Shaper s/n M-153-VS8 w/ 20” Rotary Table, Power Feeds. Palatek mdl. 50DUR 50Hp Air Compressor s/n 97A025. Geared Head Drill Press s/n 61133 w/ 85-1460 RPM, 8-Speeds, 18” x 25” Table. Summit mdl. 38SP Power Drill Press s/n 312 w/ 30-1200 RPM, Power Quill, 18” x 30” Table. Armstrong – Blum Marvel Series mdl. 81A8/M3M/M5 18” Vertical Miter Band Saw s/n E-275588 w/ Hydraulic Clamping and Feeds. Armstrong – Blum Marvel Series 81 mdl. 81-9/M3M 18” Vertical Miter Band Saw s/n E-355888-I w/ Hydraulic Clamping and Feeds. 22” Sliding Vertical Band Saw w/ 72” x 120” Cap, Back Fence, Double-Edged Blade. Grob mdl. NS36 36” Vertical Band Saw s/n 984 w/ Blade Welder. Grob mdl. NS18 18” Vertical Band Saw s/n 5440 w/ Blade Welder. Fosdick 17” Column x 72” Radial Arm Drill s/n 138267. Webtron mdl. 650 Multi-Color Label Press s/n 2-1148-114. Intercont Products mdl. PTW-1S Wash Line s/n Q8184013 w/ 16” x 10” Cap. 3-Ton Cap Floor Mounted Jig w/ Electric Hoist. Royal 18” Pedestal Drill Press w/ 390-3100 RPM. 24” Abrasive Cut Off Saw. Troyke 20” Motorized Rotary table w/ Controller. SIP 23 ½” Rotary Table.